Judging the value of historical art is a very subjective affair. Some art experts appreciate the skills of the 17th Century masters, some like the emotions conveyed by the impressionists and some prefer the conceptualism of modern art. Arguing about the quality of these different movements seems as useful as arguing about which religion is the truest. There is a tool however to judge individual art more objectively. 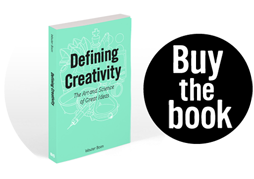 It is the scientific definition of creativity. According to this definition a work needs to be ‘new’ and ‘valuable’ to be creative. ‘New’ means a work is original and never created before. ‘Valuable’ means the work is appreciated by an audience. Or, more specifically, by the experts within a certain creative domain – who have more influence on the value of a work than the average ‘consumer’. In the art world the experts that judge a work’s value are – among others – the art critics, art historians and the curators of galleries and museums. The novelty – or differently put, originality – of a work is not always easy to assess. That is, when a work for the first time enters the market it’s relatively easy for the expert to judge its originality. After all, within their field, experts are walking encyclopedias; they know exactly what has been created before and whether something is entirely new or more or less copied from a work that existed already. However, to judge the originality of a work that was created a few centuries ago is much more difficult. The reason is that when you look at a historical work today it will look quite similar to other works by other artist created in the same period – especially when they belong to the same art movement. The older the work, the more difficult it is to assess its originality directly after its conception. As I wrote before on this blog, you should never judge a historical master from a contemporary viewpoint, but this is exactly what ‘value’ does. The reason is that value can only be measured by how much a work costs on the market or how long one needs to wait in line to admire it in a museum. This means that value is always measured today. If artworks were judged by the value they had when created, Van Gogh’s works, for example, wouldn’t be creative. After all, his work was not widely loved when he died. He was ahead of his time with his bright colours and rough strokes. Only after he died his work became wanted. So the value of his works has changed over time, and measured by today’s standards they are among the most valuable in the world. Since the ‘value’ of art is measured today and much easier established than the ‘novelty’ of a work when it was created, this second part of the definition of creativity often overshadows the importance of a work’s originality in establishing the level of creativity. This could easily change if it’s up to Ahmed Elgammal and Babak Saleh of Rutgers University in New Jersey. Last month they published an article in which they explain a way to judge a work’s originality more accurately than the subjective perception of the art critic. To establish the originality of a work directly after its conception Egammal and Saleh created an algorithm that measures the influence of a work over time. 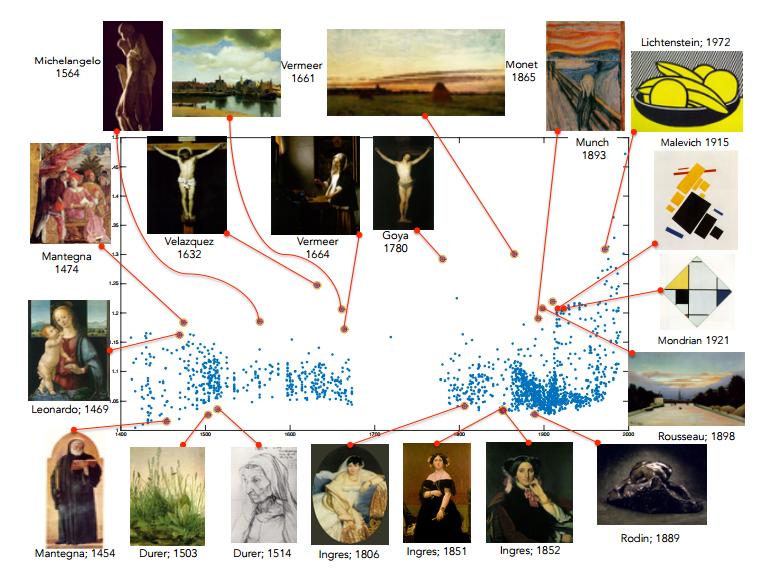 They did so by using a database with 62,000 historical works and mapping out how each painting visually links to similar paintings in the past and future. By doing so they can see how much influence individual works have had on others. The more future links a work has in relation to its historical links, the more influential and thus original it is. Egammal and Saleh thus looked at the history of art as a network of influence, just as scientists look at super spreaders of diseases, city planners at the busiest intersections in a city and coders at the most influential people in a social network. The image above shows some of the results by plotting the artworks by date along the horizontal axis and by a work’s influence – which is the score it received from the algorithm – on the vertical axis. By depicting the works in this manner you instantly see, for example, that Vermeer (another Dutch painter – no coincidence here) in the 17th Century was very influential with his Gezicht op Delft (‘View of Delft’) and Vrouw met Weegschaal (‘Woman holding a balance’). The process is not just more accurate than the gut feeling of the art critic, but also automated. The researcher from Rutgers built an algorithm with very advanced software that is able to dissect an image in different classemes (or tags, as I would call them), which are the different features of a painting, such as colour, texture and technique. But it can also recognize more sophisticated features such as a person, house or landscape. And even more subtle depictions can be recognized, such as walking, specific interactions between individuals or death. The algorithm is able to produce a whopping total of 2,559 different classemes, which thus enables it to make quite an accurate description of an image. Finally, the technique can even form a framework for assessing a wider range of creative products, such as sculptures, literature and poetry. It could therefore become a structural extension of the definition of creativity that will give more weight to the originality of a work. Which means that in the future a discussion between art critics about the merits of an individual work of art doesn’t need to be simply based anymore on their subjective taste or today’s value, but can also be based more directly on the influence the work has had on the history of art.